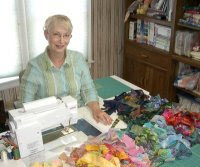 Elsie M. Campbell and Aunt Mimi's Quiltworks: More and more summer fun???? More and more summer fun???? My newest summer project on my design wall. What do you think? 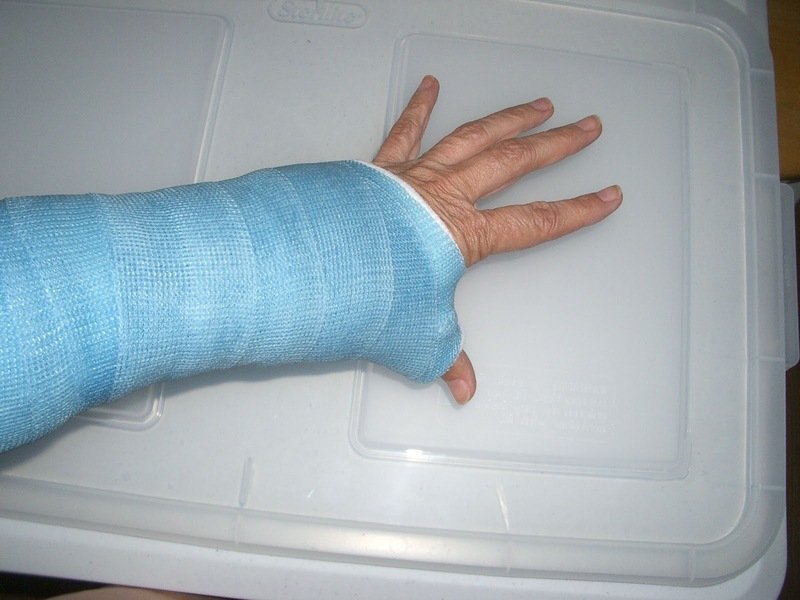 and before the cast was applied. completely disabled for the time being. Needless to say, I've needed some escape-type of entertainment. 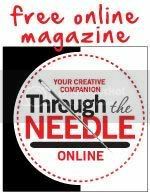 So, I've turned to my sewing room and a new project. Here are some of the details. 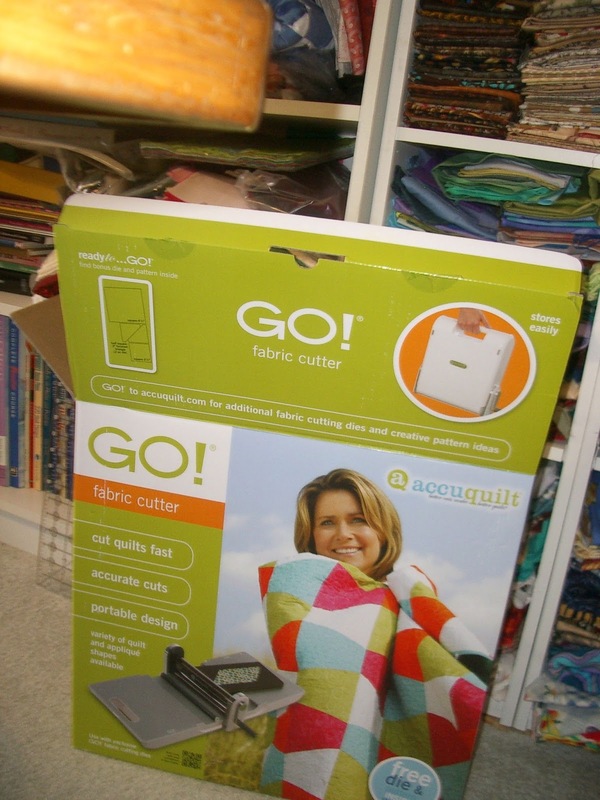 Since I really struggle right now with a rotary cutter because I cannot manage the rulers, I found a marvelous new addition for my sewing studio: A GO! cutter and dies, lots and lots of dies. 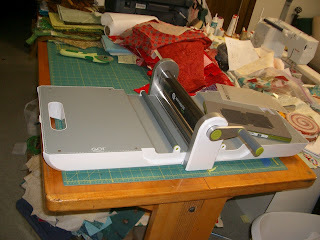 This makes it so easy for my to cut all the little pieces I need for my new project. I'm using 3 dies: The 2" finished quarter square triangle die, the 2" finished square die, and the 2" finished half-square triangle cutter. 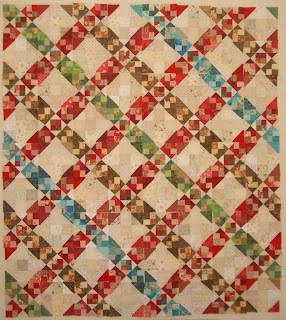 I'm also using the 1 1/2" strip cutter since they do not make a die for 1" finished squares. I can manage to cut pieces off the 1 1/2" strips to make the squares, if I sit down, use my left elbow to hold the ruler, and my Martelli ergonomic cutter in the right hand. 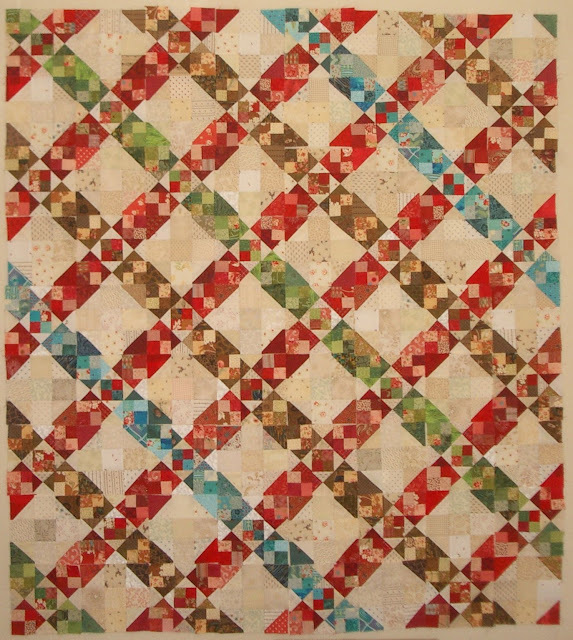 I actually purchased 2 sets of 1 1/2" pre-cut strips known as 'honey buns' from my local quilt shop (Completely Quilted), too, so I have plenty of little squares for the alternate Variable Star blocks. 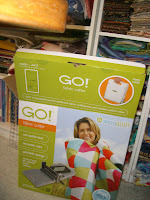 My new GO! 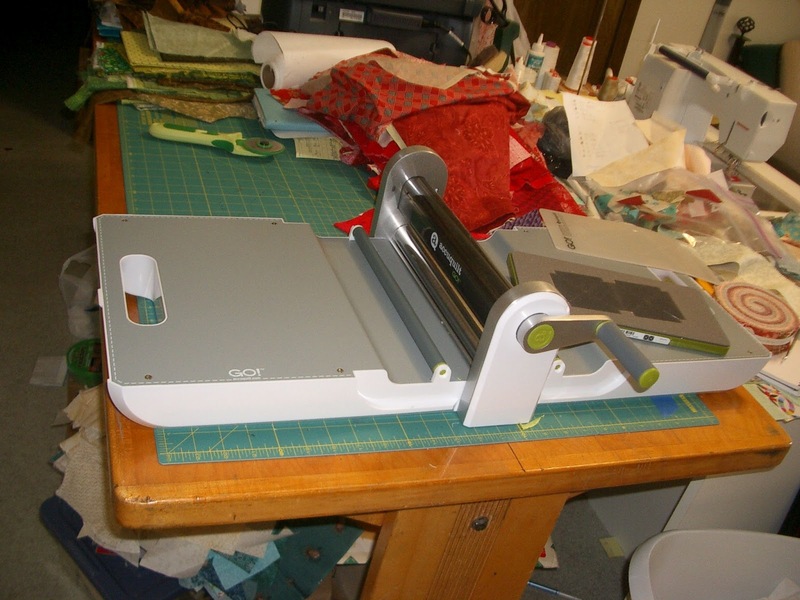 cutter in use. I love it! Here's what I am making: 6" finished snowball/nine-patch blocks. Each block has 2 red corners, one brown corner, and either a blue or green corner. 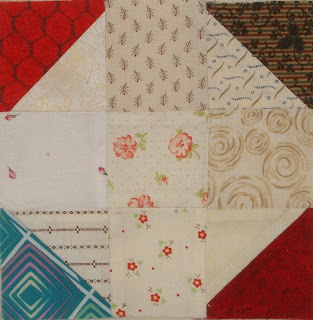 Each square in the block will finish at 2". Close up of the pattern. Here is the photo of the developing pattern. I will need to make 143 blocks, total, plus edge finishers and borders to make the quilt top queen sized. Don't you love it? This is certainly better than sitting around stewing and fretting about the botched kitchen remodel, the excessive heat that is killing my gardens, and the itchiness of the cast on my left hand, don't you think? 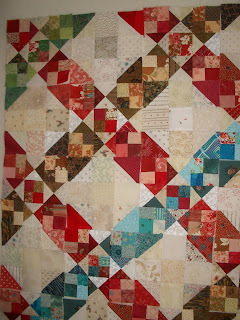 This is about 1/3 of the quilt top when finished. Wow, that surgery looks serious. Will you be able to hand quilt once you heal? 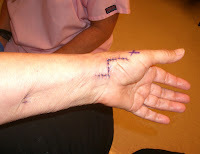 Janet, Yes, that was why I had surgery, so that I can get back to doing hand applique, and hand piecing. 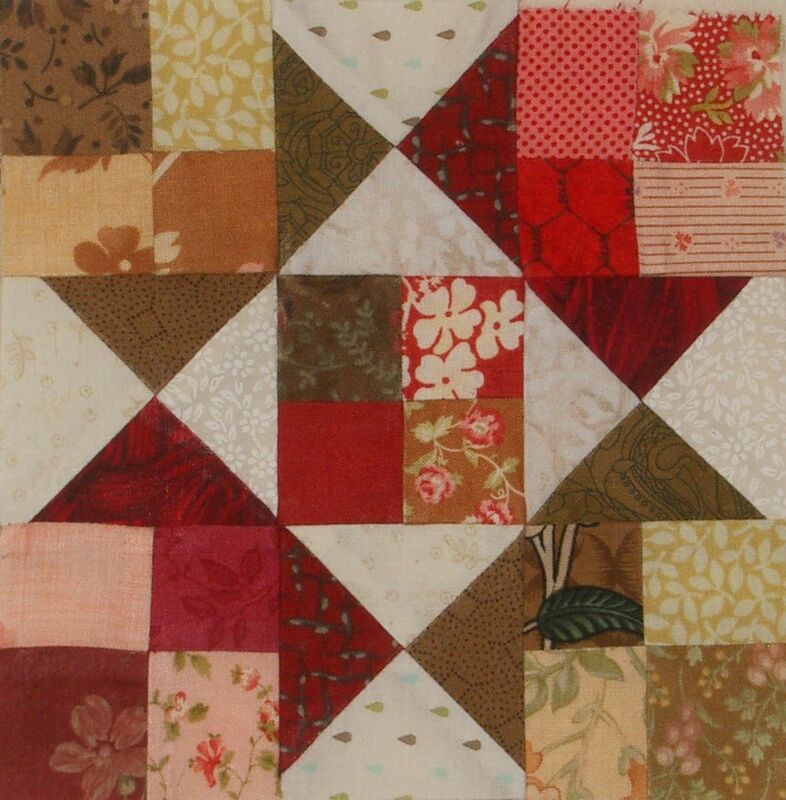 I had no problem before with the hand quilting process. 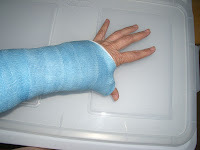 I can even hand quilt with my hand in this cast since I am right-handed and this is my left hand. Thanks for your concern. So glad you'll be able to do what you love once recovery is complete! Love your summer project - the colors remind me of Oklahoma/Texas summers - dryness, heat, colorful flowers - a little grass - a little rain - perfect! Maybe that's why I have been drawn to these colors recently. The last 2 quilt tops I've made since our move back to Oklahoma have ysed these same colors.